We woke up Sunday morning to my good old cell phone alarm clock. I don’t have service on that phone right now – we have been very bad about getting cell service worked out, even though my brother did all the legwork for us – but I had my phone with me when we left home, and it remains with me to this day (as opposed to my shipping it home, at any rate). It has been useful for playing Tetris and as a timepiece. None of the three of us wears a watch, anymore; we all use our cell phones to tell time at home, so without my phone we’d be lost. Why did we finally actually set an alarm? For Mass, of course! We had tracked down a church that has an English-speaking Mass in downtown Lisbon. Apparently the priests who staff the parish are a group of Irish Dominicans who have been here for several hundred years. (Ah, yes – they arrived in the year 1600, according to their website.) Lovely as the Mass was – I, for one, got quite a bit out of it – David would like to try a real Portuguese Mass experience next weekend as opposed to the expats-and-tourists vibe. Stay tuned next week for that report. We were actually a bit late for Mass as poor Quinland was not feeling well. That girl has been fighting one health issue after another on this trip. She spent the day before the trip at Kaiser Urgent Care getting IV fluids and antibiotics, has dealt with a horrid cough the whole week, and now has an upset stomach. After church, we decided to get her home to rest instead of taking the planned walk through town. It worked out fine for me, because I had to get some steroids in my body, pronto. Doing the pulse steroids treatment in Europe doesn’t seem like it is going to be a big deal. It may actually be less stressful than at home, where I have to worry about missing work. My day was pretty low-key: I came home from church, popped four handfuls of pills, swallowed a bunch of calcium, and then hung around. Ultimately, I slept the day away, got up and had dinner with David and Quinland, and then slept some more. I took the second dose right before bedtime along with a sleeping pill, but it really didn’t knock me out as quickly as it usually does. I actually stayed up on the internet for hours waiting for it to kick in. Expenditures: Groceries at the Cais do Sodre train station on the way home from church. 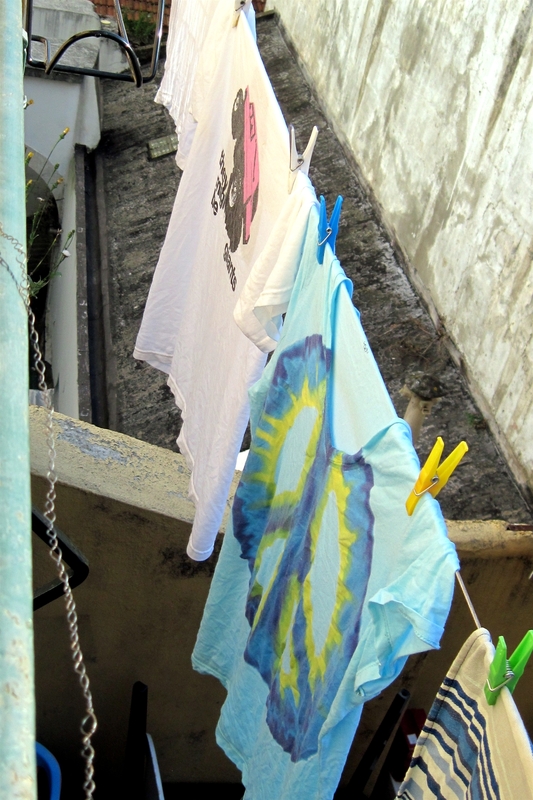 Experiences: English-speaking Mass in Portugal; first steroids in Europe; Q getting a chance to hang laundry on the line (this clothesline-from-the-terrace thing is big in Lisbon, so it really makes us feel like we live here). We also found a bike shop that rents helmets, locks and baskets along with their bikes (as opposed to the bike shop in our building), and we got directions on riding from Cais do Sodre to Belem, and then taking a ferry over to the beach. I think this will be our outing next Saturday.